Greetings from Prague! 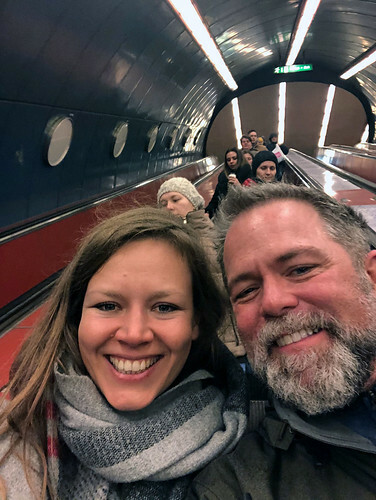 I’m just over halfway through my European vacation, so I thought it’d be fun to share some of my adventures and to take a glimpse at the financial side of this journey. This trip is unusual for me because I’m traveling with a party of six. My cousin Duane has terminal cancer and wanted to see some more of the world while he still can. A few family members decided to join him. 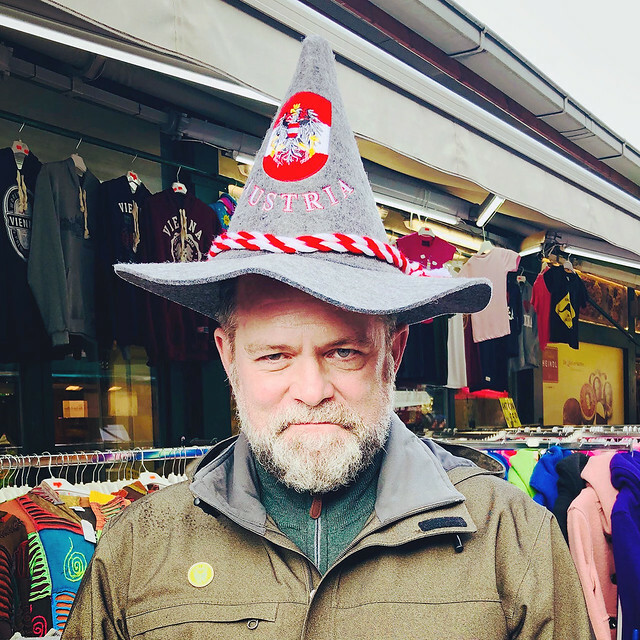 We’re exploring Christmas markets as a group. For the most part, Duane’s health has been fine over the past two weeks. He tells me that he’s felt great lately, and he’s hopeful he has more life left in him than the doctors say. (Who knows? Maybe he and I can squeeze in another trip before his time on this Earth expires.) 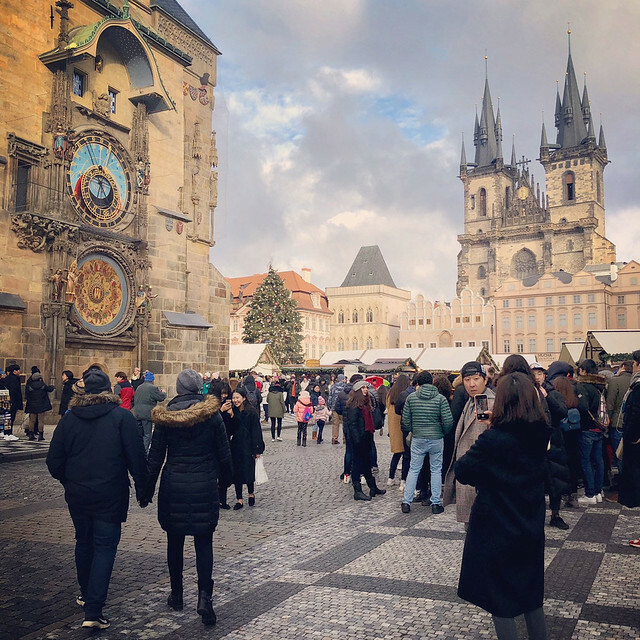 That said, he did have to take a short rest yesterday because he became dizzy and disoriented as we strolled the cobblestone streets of Prague. He’s obviously not feeling 100%. Our group doesn’t have a set agenda. We’re merely moving from city to city, exploring the Christmas markets and other touristy delights. Often when I travel, I’m a traveler not a tourist. Right now, I’m a tourist. I wouldn’t want to do this every trip, but I’m fine with it at the moment. So far, we’ve been we’ve been to Vienna, Budapest, and Prague. I liked Vienna. I loved Budapest. But after 24 hours here, I’m ambivalent about Prague. I didn’t like it at first, but the city is growing on me. I think one problem is our location. Here in Prague, however, we’re staying in the downtown core, which means we’re immersed in the tourists. (Yes, I realize that we ourselves are tourists and thus part of the problem.) There’s no escaping the crowds and commercialism because of our location. This is an interesting lesson to learn for the future: Stay close to downtown in popular cities but not in the downtown. If you’re close to a transit station, it’s plenty convenient to get where you want. 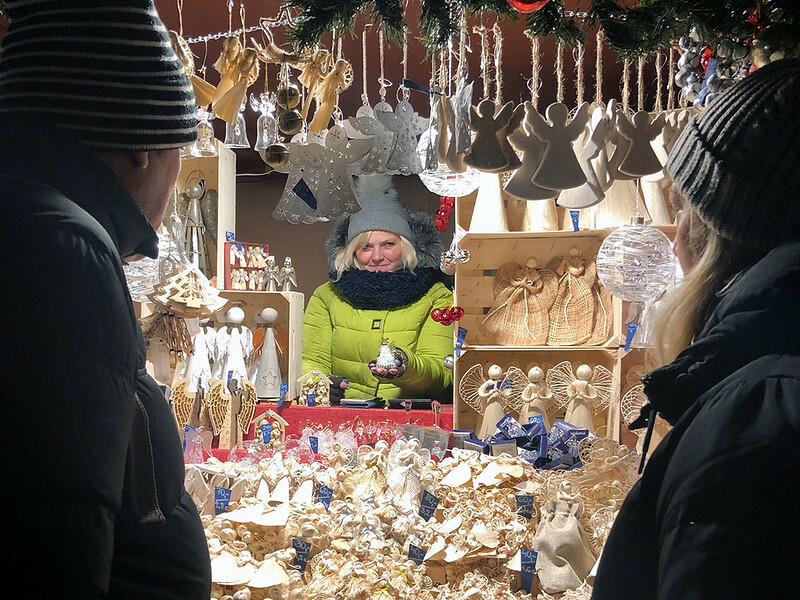 The Christmas markets have been festive and fun. They remind me of Portland’s Saturday Market, a craft market held every weekend in my home city. Vendors erect small stalls where they sell either food or wares. I’m more interested in the food stalls. In each individual city, these “huts” are similar to each other. But the food offered varies from city to city. We all brought warm clothes, but each of us has had a turn getting chilled to the bone. One night in Vienna, I was the coldest I’ve ever been in my life. While the rest of the crew enjoyed ice skating, I made a brisk one-mile walk back to the flat so that I could take a hot bath. Everyone else has been equally cold at some point. I’m a little worried about Switzerland. The forecast low for when Duane and I arrive in St Moritz tomorrow night is -25 celsius (-13 fahrenheit). Holy cats! While I’m not pinching pennies on this trip, I’m doing my best not to be profligate either. It’s interesting to see how my travel habits have changed over the past decade. I used to spend a lot to buy a lot. Now, I buy very little. What I do buy is mostly food. During my first trips to Europe almost a decade ago, I was very much a tourist as opposed to a traveler. I wanted to go to the tourist spots and to buy tourist goods. I talked to every tout. My compulsion to buy was very very strong. Even in 2010, after writing Get Rich Slowly for nearly five years, I had some bad habits with money when I traveled. I remember when my ex-wife and I landed in Venice, the first stop on our three-week tour of Europe in autumn 2010, I found a funky used bookstore. I bought fifteen pounds of books on the first day of our trip. I had to carry that weight with me for the next twenty days. On this trip, I’ve bought little despite spending hours and hours and hours in markets. In Vienna, I bought a t-shirt as a souvenir, and I bought a Christmas gift for my niece. 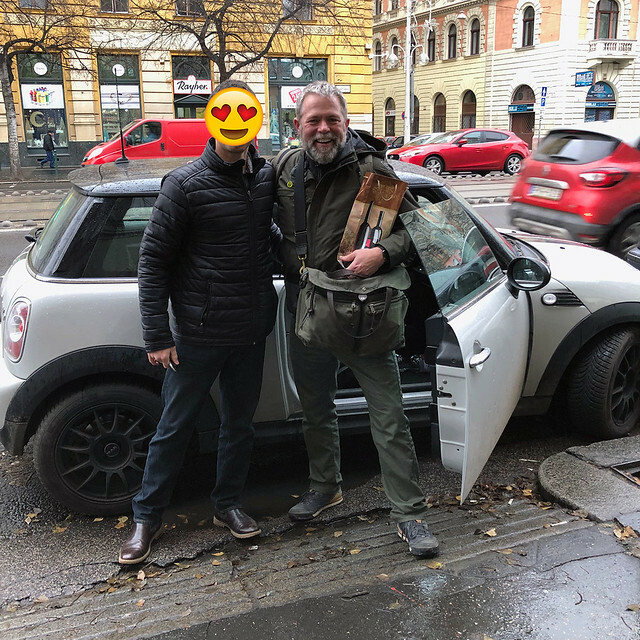 In Budapest, I bought some warmer clothes and a Christmas gift for my ex-wife. I’ve bought nothing so far in Prague, although I expect to purchase a gift for Kim before we move on. We’re spending little on transportation (aside from connections to various cities). We walk a lot — about ten miles per day — and we take advantage of the fantastic transit systems in each city. We’re on our feet over twelve hours each day. As a train nut, I enjoy riding the subway. I was particularly enamored with the Budapest metro system. The stations are beautiful, especially the old M1 (opened in 1896, it’s the oldest electrified underground in Europe) and the new M4 (whose stations feel like sets from a science-fiction film). We’re not paying much for lodging either. Instead of spending $150 or $200 per night per couple on hotels (for a total of $450 to $600 per night), we’re renting rooms through Airbnb. This costs us between $75 and $150 per night for the group. That’s a huge savings! Plus, renting flats gives us a tiny taste of what it’s like to live as a local. Our food expenses are hit and miss. Left to my own devices, I’d eat restaurant meals now and then but not often. When I travel, I like to buy a few groceries — bread, meat, cheese, fruit, juice — to keep in my room for breakfast and snacks. I grab a quick lunch in the afternoon, then maybe eat a sit-down dinner featuring local cuisine. This is relatively cost-effective. My cousins like eggs for breakfast, though, and they need their coffee. We’re frequently starting the day in restaurants. (They can’t always find their eggs, though, because egg breakfasts are much less common in Europe.) 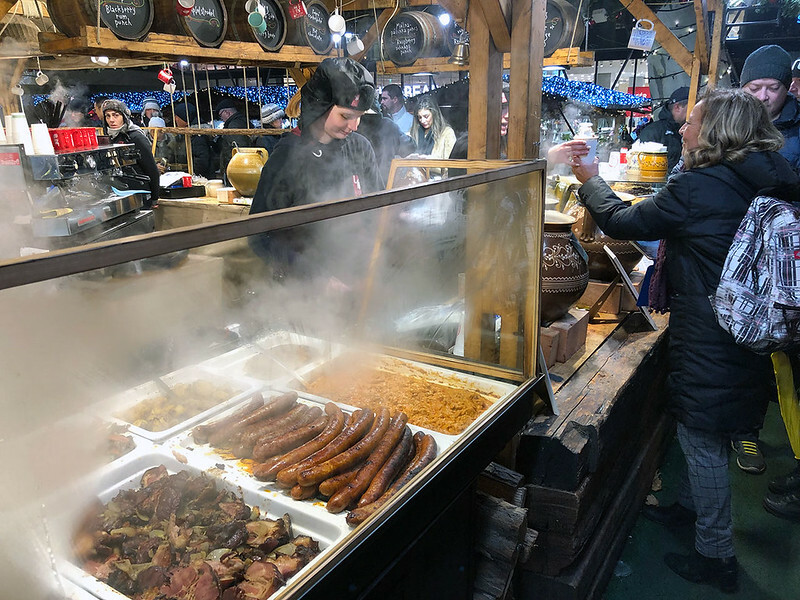 We frequently snack or lunch at the Christmas markets, which is less expensive than visiting restaurants, but our dinners are always restaurant meals. One big factor in our finances is currency exchange. 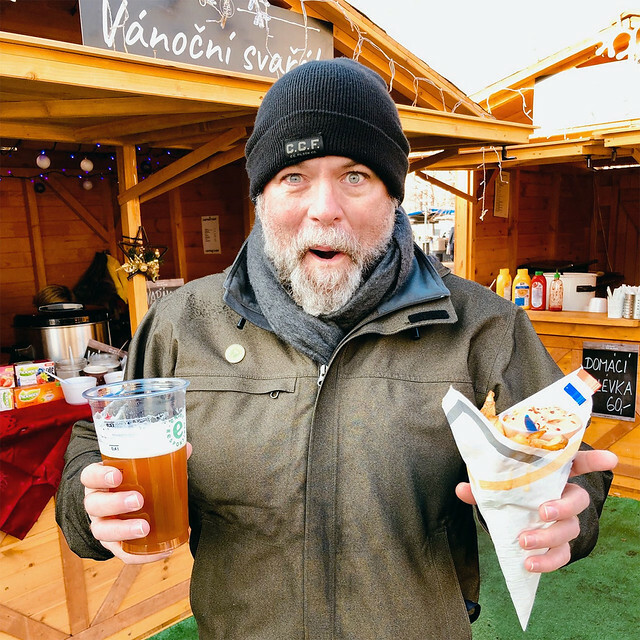 Most places took credit cards in Vienna but not the stalls in the Christmas markets. In Budapest, most places did not accept credit cards. In Prague, it seems to be variable. As a result, we have to carry cash. Not every source of cash is created equal. Here’s an example: We landed in Prague late in the evening. We needed some cash to buy tickets for transit (and to grab some food), so I offered myself up as sacrificial lamb at the airport. I was carrying 137 U.S. dollars, which I exchanged for roughly 2340 Czech crowns. The exchange rate was something like 1 to 19.2. Yesterday morning, my cousins pulled money from a bank ATM. They got an exchange rate of roughly 1 to 22.4. I’ve had a lot of fun on this trip so far. I’m traveling in a very different way because I’m not the one deciding where we go when. My cousins are directing the decisions, and that’s fine. It allows me to see how other people travel and what their priorities are. All the same, I do hope to return to these cities in the future to do some “J.D. travel”. My favorite city of the three so far has been Budapest — and by a wide margin. I loved the history, I loved the culture, I loved the food, I loved the people. I have no doubt that I’ll return for a more leisurely visit in the future (possibly as soon as August or October, the next two times I’ll visit Europe). I feel like every vacation offers certain highlights that become the core memories I carry with me. Midway through this trip, I’ve enjoyed three five-star highlights, each of which was in Budapest. The weather was sunny, clear, and cold. We ducked inside a coffee shop for a few minutes. When we emerged, it was pouring rain. There had been no indication (or forecast) that rain was imminent, so we were unprepared — as was everyone else, tourist and local alike. I enjoyed the caves themselves, of course, but also the history. The real-life Dracula — Vlad the Impaler — was supposedly imprisoned in the labyrinth for an entire year. Also, there’s a section of the tunnels that’s completely dark. It’s pitch black. For maybe 50 meters, you make your way by feel. (There’s a rope attached to the wall, if you want it.) So fun! When we arrived in Budapest, we walked a mile from the train station to our flat. As we were puzzling out the intercom system, a man stepped up to me. “Are you J.D. 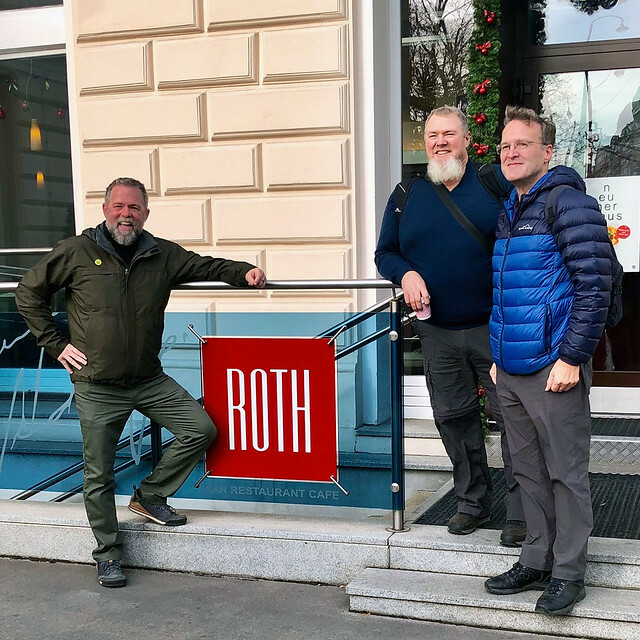 Roth?” he asked. I was surprised. “Yes,” I said. He handed me a bottle of wine and an envelope with my name on it. “My name is Ferenc. I read your blog,” he said. 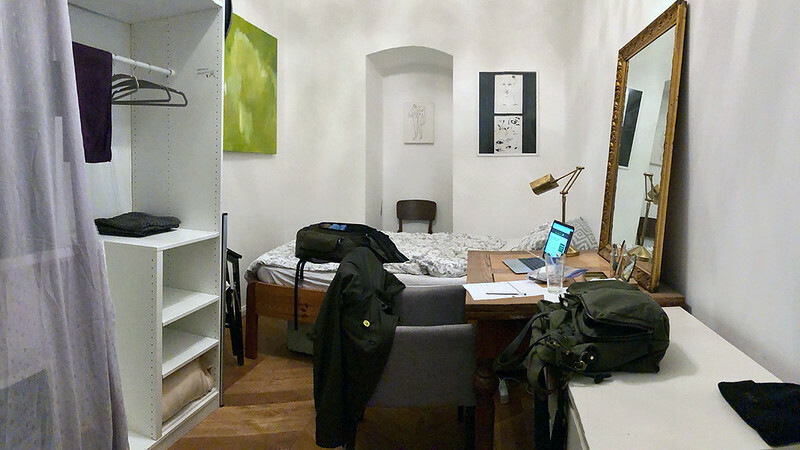 Turns out, he had determined where we’d be staying based on an Airbnb screencap I shared a few weeks ago. He’d spent two hours parked in front of the flat, waiting for us to arrive. He gave us a warm welcome and some tips about his city. Later, I wrote to thank Ferenc. “Thanks for greeting us. Do you want to grab coffee or beer?” I asked. “Sure!” he said. “I have to work all day today. Later, my son has a soccer game, then I have dinner with friends. But I could meet you at 23:30.” I’m no longer a night owl — plus I’ve had bad jet lag on this trip — so this normally would be a no-go. But hey! This was a once in a lifetime experience, right? Ferenc picked me up in his Mini Cooper at 23:30. As we sped through the streets of Budapest looking at the beautiful lights, he told me about the history of Hungary and about daily life in Budapest. He drove me to his favorite viewpoints so that I could snap photographs. 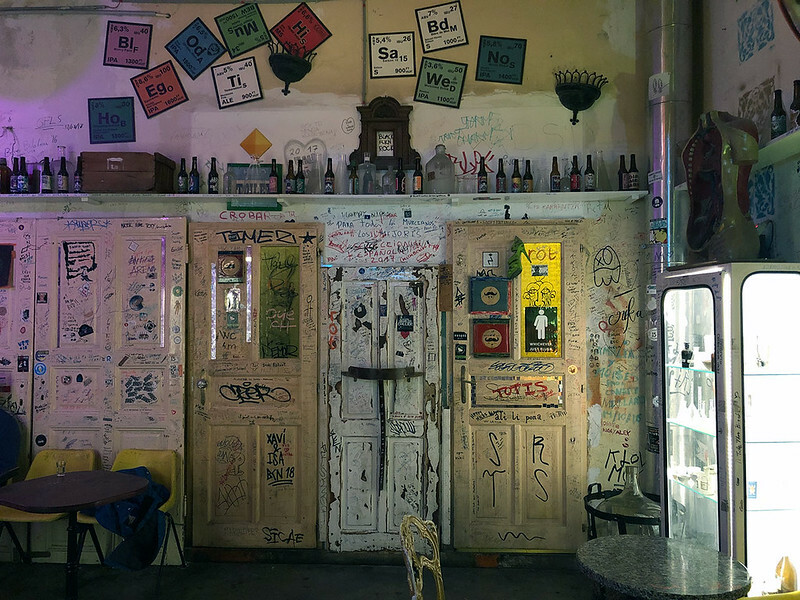 Then, when we were finished sightseeing, he took me to a “ruin bar” named Szimpla Kert, which was started by one of his friends from high school. Ruin bars are exactly what they sound like. They’re pubs that have been built in hollow, decaying buildings. Instead of remodeling these spaces, as we would in the U.S., the Hungarians have left them in a state of decay. Inside, they’ve added bars and stages and dance floors and other pub amenities. They are very, very popular among Europeans. Ferenc and I stayed out until nearly 03:00, drinking beer and chatting about life in our respective countries. (Naturally, much our talk revolved around personal finance.) To me, this experience is what travel is all about. It’s not the Christmas markets that I love (although those are fun), nor the cathedrals nor the castles. It’s connecting with real people and real life. The next morning, I was up early. At 09:30, I met another GRS reader for coffee. Vica is a landscape architect who lives near Budapest’s main train station. She is warm and funny and engaging. As we sat in the basement coffeehouse, she told me about life in Hungary and about her goals for the future. She shared the places she loves to travel around Budapest. When I complained about how cold I was, she volunteered to take me to a shop where I could buy a couple of quality items at reasonable prices. As we walked to our destination, she gave me a tour of the city. As a landscape architect, Vica seems fascinated by urban design. It was interesting to see things through her eyes. While we talked, she helped me understand more about the Hungarian language, which is quite difficult for native English speakers. Vica and I spent more than four hours walking across Budapest, and I enjoyed every minute of it. As I said, when I remember this trip in the future, it’s my time with her and Ferenc that will come to mind first and foremost. I’m eager to meet up with other readers on this adventure. On Sunday, Matthias will join me and Duane for our ride on the Glacier Express across the Swiss Alps. I also have invitations to visit readers in Cologne and Luxembourg, although I’m still uncertain whether I’ll be able to make those connections work. I hope to! I’ve been in Europe for eleven days now, and I have nine days left on this trip. Four of my cousins fly home tomorrow morning. At that time, Duane and I branch off for adventures of our own. First, we’ll fly to Switzerland to take the train ride through the Alps. All told, it’ll take us three days of travel just to enjoy that eight hour trip. We’ll spend very little time actually seeing Switzerland. On the surface, that’s ludicrous. But because Duane and I both enjoy the process of travel, it’s actually a worthwhile excursion. Plus, Matthias will join us with a bottle of whisky! Finally, Duane will branch off to Munich and I will…I don’t know. I have three days and no plans. I have those invitations to visit GRS readers in both Cologne and Luxembourg. The offers are tempting. But I haven’t yet seen anything of Germany, so I might simply make my way to Berlin (from which my final flight departs early on the 23rd). We’ll see. As always, this travel has given me perspective on my life back home at Portland. It’s made me more mindful of my daily habits and routines, made me think about the things I need to change in order to become a better version of me. I always find it fascinating the way comparing how I normally live to how others live in different countries can be such a transformative experience. Until I get home, this site will continue to host guest articles from some of my favorite people. I hope that you’re finding them worthwhile. After Christmas, things will return to normal around here. Until then, I hope you’re all staying healthy and growing wealthy. Happy holidays! My biggest mistake on this trip? I grew a beard because I thought it would keep me warm. I always have a mustache and goatee, but I keep them relatively short. Now I have a full beard and I hate it. It itches. It makes me appear 69 instead of 49. And it gets in the way of my food and beer. There’s a barber just outside our flat here in Prague. Once I publish this article, I may ask them to shave me.